Why a Hatchery at Miramichi? In 1920 a sub hatchery was constructed on the Southwest Miramichi river at Juniper. The facility was called the Sparkle hatchery and the purpose of this hatchery was to facilitate the release of the fry from the Miramichi fish Hatchery. 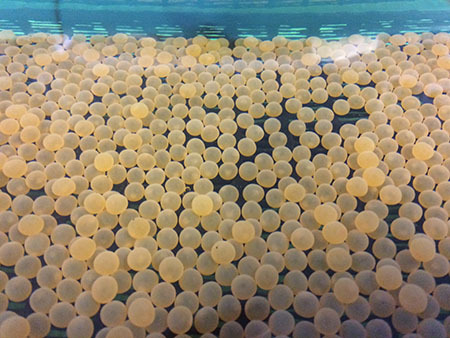 Eggs would be transferred by train from the Miramichi Hatchery to the Sparkle hatchery in early spring when the eggs were well eyed. The eggs would then be laid down at the sparkle hatchery and released into the main Southwest Miramichi river once they hatched. Transportation of the newly hatched fry was a main concern for the staff at the hatchery in the early days of fish culture on the Miramichi. Fry destined for the Southwest Miramichi river were transported by train and distributed into areas of the river that were in close proximity to the tracks. Fry distributions on the North West Miramichi was more of a problem. There were no train tracks along this river and so the fry were distributed using wagons on roads used for the lumber industry. This could be a day long excursion as the roads were not in the best conditions which many times caused hardship to the fry. © Miramichi Salmon Conservation Centre. All Rights Reserved.